After Nussbaum's eloquent salute to the Reign Man yesterday, there was little left to be said. We've all got our personal stories. I remember in his early years, how his jutting, supernatural calf muscles often made me uncomfortably transfixed on a man's legs. Or how my friend in college made a rap demo for Shawn Kemp and asked me to draw a cartoon of him for the cover (thankfully no copies remain in existence). Mostly, I just remember the dunks. Those other-wordly leaps that made your jaw drop and your drink splash on the floor. Those ridiculous off-target alley-oops Payton would throw that no human had a right to be able to catch. But he always did. So you've heard our from us (twice!) —now it's your turn. What is your favorite Shawn Kemp memory? It's time for sharing. Official Supersonicsoul Shawn Kemp Theme Song: The Who, "Love Reign O'er Me"
Mine is the dunk at MSG - nothing else is close, really. Up to then, he was shawn kemp, but after that he was SHAWN KEMP. He had lots of dunks as good or better after that one, but that was the first one I remember seeing that made me say - "Holy Crap, this guy is unbelievable! And he's on our team!" I would have to agree with ryan..that dunk he threw down at MSG checks in #1, even the Knicks players on the bench were going nuts after that throwdown..I remember trying to describe it to couple of friends at school next day and they didn't believe me..until they saw the replay for themselves..lol.. I'll third that sentiment. Here's the link (it's number 3 on the top 10 list). FEROCIOUS. Thats it, he was just ferocious. When the Reign Man dunked it wasn't soft, he punished that ball and strained the rim afterwards. Fierce competitor. 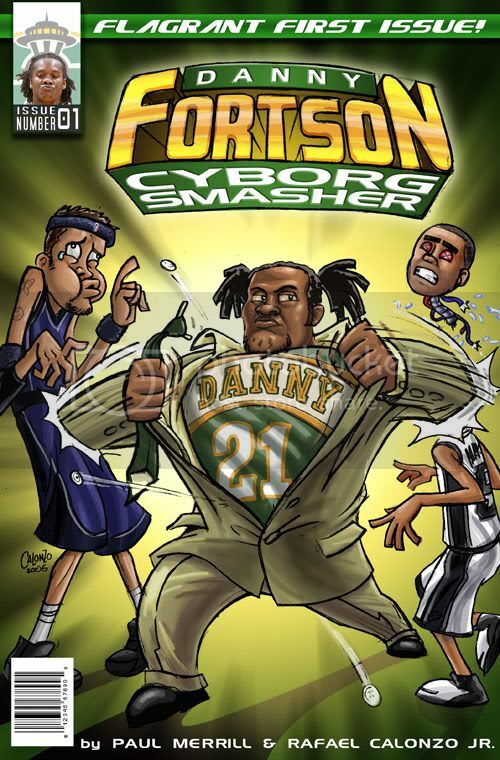 In that Bulls/Sonics Finals he had that play where he abused Rodman with a lightning quick spin, then threw down a reverse that had him sitting on Rodmans shoulders while he hung from the rim. Thats the Kemp I'll remember and the Sonic team I'll never forget. How do I get ahold of a tape/dvd of the full 96-97 finals series? Anyone got a tip? My first memories of basketball were of KC telling me across the radio every juicy second of the glove to the Reign Man or "Man Child". Shawn Kemp was a big reason I fell in love with basketball. My favorite Kemp memory isn't a dunk. It was in the 96 Finals against the bulls when he pulled down like 4 or 5 offensive rebounds in a row, and finally got a put back to go in + the foul. I loved that 96 Sonics team. 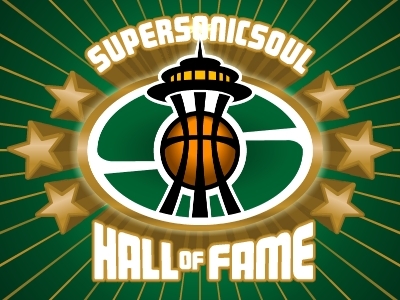 Many people forget that the sonics won 63 or 64 games that regular season. Mostly because the bulls won 70 or 72 games that year. I remember when he was featured in SI under the heading, "Sonic Boom". My #1 Sonics memory, which counts as my top Kemp and Payton memories as well, has to be the fast break alley-oop against the Warriors in the '93 playoffs. I can barely describe what it was like to be in that building, with 17,000 other crazed, Sonics freaks, witnessing that particular moment. "Electrifying" is the closest word I can come up with. When Gary threw the lob, everyone there stopped breathing, stopped blinking, stopped pumping blood through their veins, sharing the same thought: "No. Effin'. Way." In my memory, Shawn took off from the 3-point line and hung in the air for at least 23 of the 24 seconds on the shot clock. And when he caught the ball and demolished the rim in a single motion, he detonated a bomb. Some kind of instantaneous eardrum-bursting, undergarment-soiling bomb. Absolute pandemonium. Yeah, sorry. That's the best I can do. I remember seeing him in a Sonics uni for one of the very first times he wore one. He and Dana Barros, at St.Martin's College in the pre-season rookie year. Dana played a lot, but I kept waiting to see Kemp, and he sat way down the bench, his legs bouncing in anticipation while waiting to get in. When he did get in, he was the most whirling dervish out of control FREAK I had ever seen. And I loved him. I don't remember any particular play, I just remember how energetic he was that game. It could have been his first in a Sonics uni, and it may not have been. I don't remember. I just know, I wanted to be that freakishly intense when I played. When I later suited up for the Saints, I thought about the fact that Shawn Kemp played on the very same floor! His son, Shawn Kemp Jr., is an incoming freshman at the University of Washington and will play on the basketball team. For Kemp dunking on Rodman!